San Francisco, United States, 2018-Dec-10 — /EPR Network/ —The global 3D printing plastics market size is likely to reach USD 1.98 billion by 2025, according to a new study by Grand View Research, Inc., rising at a CAGR of 24.9% during the forecast period. 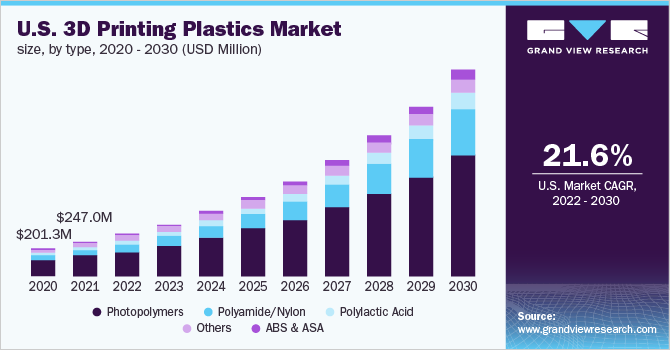 Spiraling demand for 3D printing plastics, particularly from the medical and aerospace & defense industries, is anticipated to contribute to the growth of the market during the forecast period. The 3D printing plastics market is benefitting from favorable government support in key economies such as the U.S. and China. 3D printed products assist significantly in attaining economies of scale through consumption of lesser lead time, reduced costs, and mitigated risks. 3D plastics also allows easier customization as per consumer needs. Thus, there is an upsurge in the demand for 3D printing plastics from various end use industries such as automotive, medical, and electrical & electronics. Adoption rate of 3D printing is poised to witness sharp rise across several new end user industries, which in turn is expected to lead to higher demand for printing materials such as plastics. Functional prototyping, tooling, and designing have enabled extensive applications of 3D printing across newer application areas. Consumer goods is emerging as a significant application of 3D plastic products on account of reduced lead time offered by additive manufacturing techniques. Innovative additive manufacturing solutions enable production of designer parts with complex geometries, thus, facilitating manufacturers to cater to rising consumer needs for personalized parts.Photopolymers was the dominant plastic segment in terms of both revenue and volume in 2017. Heightened demand for photopolymers can be attributed to high consumption in production of industrial prototypes through the utilization of SLA technology. Polyamide/Nylon is estimated to experience the fastest growth rate during the forecast period on account of rising demand from both domestic as well as commercial applications. Use of polyamide/nylon is accompanied by laser sintering technology. In April 2018, 3D Systems Corporation participated in RAPID+TCT 2018 held in the U.S. Product portfolio of the company consisted of several solutions, which would aid manufacturers in switching from prototyping to production and to recognize their competitive advantages. Figure 4™ platform demonstrates optimum throughput and accuracy necessary for production of plastic part.